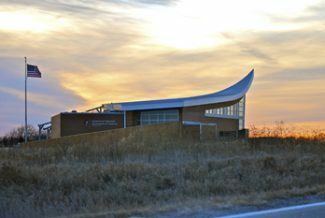 The Homestead National Monument in Beatrice, Neb. To exemplify the statement he had made nearly two years earlier, President Abraham Lincoln enacted the Homestead Act on New Year’s Day in 1863. The previous year Congress had passed four pieces of legislation that would ultimately develop the west, including: The Morrill Act, the Pacific Railroad Act, the Homestead Act and the Act to establish the U.S. Department of Agriculture. Often receiving the most notoriety of the four is the Homestead Act of 1862 which has been hailed as the most significant and enduring event to promote the United States’ western expansion. During its tenure the Act is credited with settling nearly 270 million acres, which equals eight percent of the total United States. The Homestead Act became a law that remained in effect until 1976 when the Federal Land Policy and Management Act repealed it. Alaska was the exception, receiving a 10 year extension, authorizing the Homestead Act to remain in effect until 1986. Californian native Kenneth Deardorff was named the nation’s final homesteader in 2001 by the Bureau of Land Management and the National Park Service after he was the last person to receive the title to his land in Alaska claimed under the Homestead Act. More than 4 million people filed for the parcels of land being offered during the 124 year history of the Homestead Act. Over a third of the people who received land were successful, allowing them to earn the title to their land. Under the Act, 160 acres of free land were granted to those who filed to claim it. By giving away free land the Homestead Act allowed nearly any man or woman to receive the fair chance President Lincoln spoke of. Recently, a 160-acre farm in southern Nebraska sold for a record high price of $12,000 per acre, totaling $1,920,000, which speaks volumes to the success of the Homestead Act. Daniel Freeman was one of the first people to file for land under the Homestead Act. The land he filed for was located in Southeast Nebraska, and is now the site for the Homestead National Monument. Homestead National Monument of America will be hosting the national commemorative ceremony observing the official 150th anniversary of Abraham Lincoln signing the Homestead Act. The event will feature guest speakers, musical entertainment, and a special evening show sure to amaze! Don’t miss this unique opportunity to view one of the Nation’s most influential pieces of legislation, the Homestead Act of 1862 at the National Homesteading Museum in Homestead National Monument of America’s Heritage Center. This document, signed by Abraham Lincoln, can be viewed daily from 8:30 a.m. to 5:00 p.m. Learn about where the Homestead Act resides and how it is cared for at the National Archives and Records Administration in Washington, D.C. This symposium will examine the consequences of events in 1862 including four landmark pieces of legislation passed: the Homestead Act, the Morrill Act, the Pacific Railroad Act, the act to establish the U.S. Department of Agriculture; and the year of the fateful Dakota Conflict. The symposium is sponsored by the Center for Great Plains Studies, University of Nebraska-Lincoln, in collaboration with Homestead National Monument of America. A Chautauqua was an institution that began in the late 19th century to provide higher educational opportunities through a combination of lectures, concerts, and public events. Traveling outdoor Chautauqua featured oratory, drama, music, and famous personalities. The Homestead Chautauqua will explore the different aspects and impacts of three interrelated pieces of legislation passed within 6 weeks of each other in 1862: The Homestead Act, the Pacific Railway Act, and the Morrill Act. Let’s explore and learn about how these acts impacted the Great Plains, the American West and the nation as a whole. The Homestead National Monument of America is a unit of the National Park Service located four miles west of Beatrice, Neb. Current hours of operation are 8:30 a.m. to 5:00 p.m. weekdays and 9:00 a.m. to 5:00 p.m. weekends. Admission is free of charge. For additional information, please call (402) 223-3514 or visit http://www.NPS.gov/home.